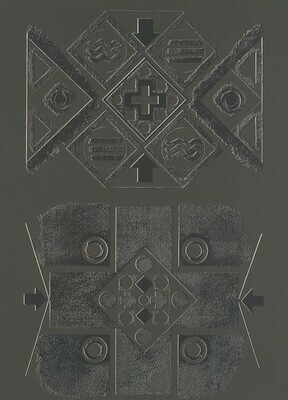 across bottom in graphite: Tamarind Impression / Landlock /George Ortman; lower left verso in graphite: 1671 / State IV / German Etching paper; lower right verso in graphite: G.E.P. Devon, Marjorie, and Peter Walch. Catalogue Raisonné: Tamarind Lithography Workshop, Inc., 1960-1970. Albuquerque: University of New Mexico Art Museum, 1989, no. 1671IV.